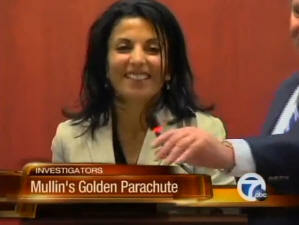 October 31, 2011 - At 3 PM on Monday, Detroit Metropolitan Airport CEO, Turkia Mullin was fired for an undetermined reason. The board of directors voted 5-2 to end her employment over what appears to be related to Mullin’s contract supposed parachute contract with Wayne County. Mullin had a job with Wayne County, when Mullin was hired as Detroit Metropolitan Airport CEO she was then for some reason entitled to a severance package from Wayne County of $200,000. As Detroit Metropolitan Airport CEO her salary was $250,000 a year, $35,000 more than her predecessor. It is believed that the Wayne County Airport Authority board of directors when they learned of this did not take this to kindly given recent layoffs and budget cuts. Wayne County Airport Authority reported the action was taken after consultation with Airport Authority Counsel and after considering the information available to the Board. The Board indicated it will not discuss any further matters about Mullin’s contract. The Board has appointed Thomas Naughton to serve as the Interim Chief Executive Officer until such time that a permanent Chief Executive Officer is determined. Naughton has been the Senior Vice President and Chief Financial Officer with the Airport Authority since 2002. Statement from Mullin - "Since my position as Detroit Metropolitan Airport CEO was terminated this afternoon, I feel compelled to express my disappointment in the way matters have evolved. "Clearly, questions surrounding my severance package should not have resulted in my wrongful termination. I was selected as Detroit Metropolitan Airport CEO following my long career path of hard work, progressive responsibilities, education, public service to Wayne County and accomplishments. When I was hired for the position approximately sixty days ago, I was called an “excellent choice” and approved unanimously by the seven-member Wayne County Airport Authority. While the quality of my work has not been in question, nor I have not been accused of any wrong doing, I now find my career coming to an unexpected, disappointing and abrupt halt. "I believe my education and experience make me uniquely qualified for the airport position. I earned a law degree, have years of experience working as a corporate real estate attorney in the private sector, I am a proud veteran of the U.S. Army, where I was twice honored with the Army Commendation Medal and Army Achievement Medal. Importantly, I have more than eight years of public service dedicated to economic development in Wayne County, culminating in the position of chief development officer. This prepared me to be a strong leader at the helm of Detroit Metropolitan Airport. "I am proud of the leadership and vision I brought to the Airport, lead by a strategic plan that focused on improving the physical airport while simultaneously driving global economic development in and around the airport grounds. We had a clear vision from day one to improve the traveler experience, increase traveler and cargo traffic, add airlines and routes and substantially reduce debt. "In the last two months as Airport CEO, working with my team, we have identified and initiated untapped revenue streams, including a parking initiative that could easily generate more than $1 million in revenue this year alone. I have met with numerous developers interested in pursuing a cargo village. We are ranked 25th in cargo after Ohio and Indianapolis. Clearly, Detroit is missing opportunities that would generate jobs and investment. "Throughout my life and career, I have acted with dedication, integrity and determination. I am proud of my work and accomplishments. My reputation has been compromised. My professional life in public service has been severely impacted. I am therefore seeking legal remedy and have retained the legal services of Bloomfield Hills-based employment attorney Raymond Sterling, Sterling Attorneys At Law".